With Thanksgiving just behind you — and what you’re thankful for still top of mind — it’s only natural to be thinking about gratitude and giving back. Giving Tuesday, which is just three days away, is vital for nonprofits. If organizations prepare for Giving Tuesday well, they’ll raise more money during this annual fundraising day, which means a greater impact on their cause. The key to a successful Giving Tuesday is to remember that gratitude is an essential element — a lesson all business leaders can learn. For instance, St. Louis Stray Rescue, a nonprofit, heavily depends on Giving Tuesday to bolster its efforts as the city’s temperatures drop below freezing in the winter. Everyone at the organization, from its interns to its executive director, gets involved on Giving Tuesday. This all-hands-on-deck approach is critical to the organization’s ability to express its gratitude for the generosity of its donors: Every person is personally thanked, no matter how large or how small their donation. What’s true for a successful Giving Tuesday is true for the business world in general. In other words, for your company to be successful, you need to express your gratitude. When looking for ways to show gratitude as a business leader, first turn to the relationships you’re most thankful for: those with employees, customers, and business partners. It’s likely not a surprise, but relationship building is vital for your business’s success. As a business leader, here’s how you can show your appreciation for the relationships on which you depend. 1. If you want grateful staff members, be grateful for them. You need to earn your team members’ gratitude rather than simply expect it or extract thank-yous from them like pulling teeth. It’s simple, really: If you want your employees to appreciate what you provide, you first need to be grateful for all they do. And don’t forget to both show and tell. Let your team know what you’re grateful for and explain why, but also express your gratitude in tangible ways. In practice, this can take the form of written thank-you notes to production team members, letting them know you’re grateful for the extra hours they’ve worked to ensure your company keeps up with consumer demand during the holidays. You might even pay for lunch one day. By practicing gratitude in this way, you could reap the benefits of more productive workers. Studies have shown that employees work harder when their bosses show appreciation for what they do. 2. 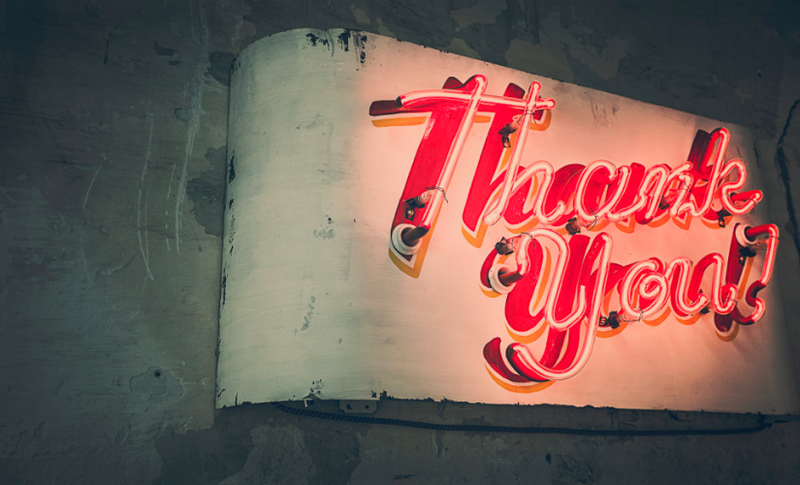 Practice gratitude to win loyal customers. In a similar vein, when you show customers appreciation, they’ll show theirs in return. You can express your gratitude to customers in numerous ways, such as holding customer appreciation events, creating loyalty programs, and personalizing services. For instance, Cindy Georghiou, owner and operator of Jaqua Bath and Body, shares promotions and exclusive offers with a small base of loyal customers before promoting them publicly. Loyal customers are likely to refer your business to a friend, and, according to the Data & Marketing Association, repeat customers spend 33 percent more than new customers. In addition, research has shown that customers want a brand that shares their values. At the end of the day, giving back will help your brand resonate more deeply with customers. To do this, your company can volunteer time to a cause that aligns with its mission, collect coats for a local homeless shelter, or even pledge to match funds on Giving Tuesday. 3. Use gratitude to build better partnerships. Gratitude can strengthen your business partnerships as well. For example, be sure to thank your technology partners when they provide a tech solution that streamlines your processes or when they put extra precautions in place to ensure your business’s data is secure. When you express gratitude genuinely and often, you’ll build trust with your business partners. Business partners lacking trust will likely hoard information that’s potentially useful — or fail to share information that could cause trouble down the road, simply because it’s not convenient. If partners build trust, however, they can operate like two departments within a single company and find more opportunities (and reasons) to collaborate. Gratitude can grease the wheel of collaboration and innovation, and it’s the right thing to do on its own. With Thanksgiving behind us and the gift-giving holidays on their way, it’s hard not to turn your attention to what’s on your wish list. Before you do, commit to practicing gratitude as more than a once-a-year event. The impact — on your staff, your partners, and your bottom line — will be greater than you think.